Professional panorama photographers and beginners alike use Panohero-H5B to create perfect tiny planets, attractive interactive panoramas and informative virtual tours of indoor and outdoor locations all over the world. 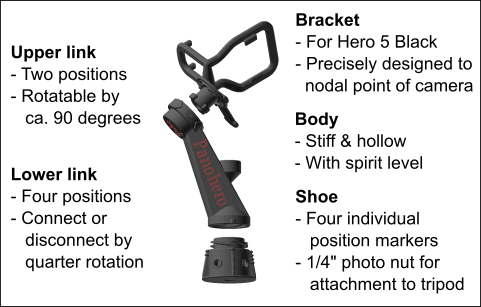 Panohero-H5B supports 2x4 positions of the camera – 4 up and 4 down for a full spherical panorama. That way the images provide plenty of overlap which makes stitching and masking a charm. Moreover, this allows for optimal automatic exposure of the lighter upper hemisphere and of the darker lower hemisphere in most situations. 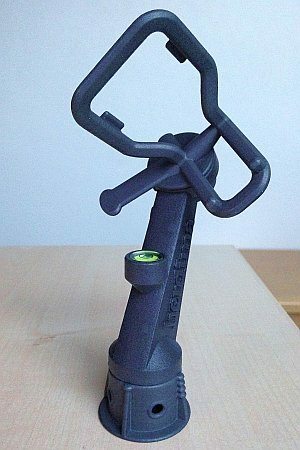 The upper link of the device provides an insertion position and two stops at about 45 degrees to both sides of the insertion position. At one of these stops, the camera covers a region which includes horizon and nadir. At the other stop, the camera covers a region which includes horizon and zenith. The lower link provides four stops. The link is tightened by a small rotation to the left and its loosened and advanced to the next position by a rotation to the right. Panohero-H5B is made from the extremely robust material Polyamide. The discreet anthracite color of the smooth and shiny parts underlines its outstanding quality. The device is built from Polyamide via SLS (selective laser sintering) at an industrial 3D-printing service company in the area of Munich in Germany on a leading edge 3D-printing machine. After printing it is carefully manually cleaned from any remaining powder. Then it is polished for a few hours in a slide grinding machine filled with small triangular stones and some liquid. At another specialized service the device is dyed in anthracite. There it receives also a coating which makes the Panohero more shiny, waterproof, non-soiling and UV resistant. The final steps are done manually at Herdima in Höhenkirchen. These steps comprise grinding-in if needed, insertion of bubble level and nut, assembly, completion with a detailed user’s manual, packaging and quality assurance. We have collected some links to panoramas shot with Panohero-H5B. With Panohero-H5B, the average stitching error is usually less than one pixel. Zenith and nadir of the stitched panoramas are perfect. Raw shots of two sample panoramas – one indoor and one outdoor – are available on Dropbox for your own stitching. Intermediate 16bit TIFF images, PTGui project files and resulting panoramas have been included as well. Hero 5 puts GPS data into the images – handy for services which require that. Good overlap due to 2x4 images. Hero 5 can be triggered with voice control. No need for remote or smartphone. The App GoPro HDR supports Hero 5.